Packing can take longer than moving. If you have a large home, packing up everything, from dishes to doormats, can take many hours. And packing correctly can take days. For those who don’t have time to spend on packing, there are packing services that specialize in packing for moves. They’ll come to your home and prep, pack, package and seal your stuff into moving boxes for moving day. There are four types of packing services for moving: (1) moving companies, (2) packing services, (3) contractors, and (4) delivery services. 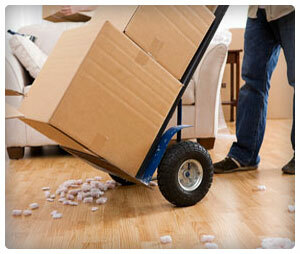 Moving Companies – Many moving companies offer packing services in addition to moving services (i.e. loading, driving). If you need help packing, ask your moving company if they offer packing services before you sign the contract. Packing Services – You-pack companies and truck rental services do not offer packing help. If you are using one of those services, you might need to hire separate packing help. Fortunately, there are many companies out there who specialize in just packing. Try searching for “[city] packing service” and see what you come up with. Contractors – There are many independent contractors out there who can help you pack. You can find them in online classifieds, in the phone book or through a friend. In each case, you’ll set a price, and they’ll come pack for you. Delivery Services – FedEx and UPS will pack your items for you on a small scale. If you want to ensure your computer is soundly packed, you might contact one of them. Packing might seem simple, but it’s not. Packing services do a number of things when providing their services. Survey – A moving packing service will first visit your home to establish what needs to be packed. This will determine the price and time estimate. Pack – When work begins, packers will put your stuff into the right type of moving boxes. Disassemble Furniture – Packers will disassemble your furniture where necessary, and package it to protect it for the move. Label / Separate – Labeling is an important part of packing, and a packing service will do it in a professional manner. They’ll also separate goods as per your request; so, if there are things you want to take with you personally, they’ll make sure you are able to. Prep – Finally, packers will prep your boxes and items in an area for easy loading on moving day. You can find packing services much the same as moving services, or any other service for that matter: by researching. Get on Google, Yelp and Yahoo!. Also, check out your local classifieds, and talk to friends, family and coworkers about it. Check here for tips about how to find reviews on a moving service.